The effect of different focal lengths. 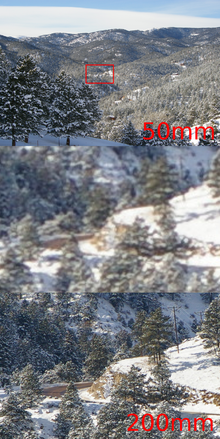 The focal length is given in the image. The effect is shown for normal film photography. The subject in the center always has about the same size. A Zoom lens from Canon. This one covers 70–200, and has a maximum aperture of 2.8. A variable focus lens (also called zoom lens) is a camera lens that can vary its focal length. In general, such lenses have a lower aperture than comparable fixfocus lenses. Depending on the manufacturer common zoom lenses (in the 30–100mm focal range, for film photography) usually have a varying aperture, from 4 to 5.6, perhaps 3.3 to 5.6. There are also some zoom lenses with a fixed maximal aperture (to take the example from before: of 2.6 or 2.8, maximum). In contrast, fix-focus lenses in that range have maximum apertures of 1.4 to 2. The top image is the image, at 50 mm. The middle image is a digital zoom to 200 mm, and the bottom image is an optical zoom to 200 mm. Digital cameras sometimes have a function called digital zoom. This is a mathematical method which simply enlarges a part of the picture. The result is not as sharp as that of the optical zoom. When an optical zoom changes its focal length, this will also change the angle of view. Digital zooms simply make a small part of an image bigger, without changing the angle of view.